Homeopathic treatment for acne works wonders and may be used independently or along side the treatment you are already on. 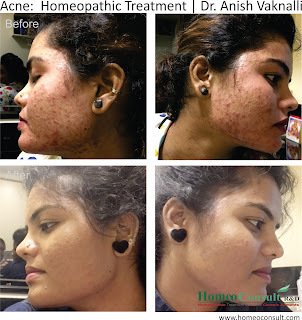 Homeopathic medicines help in curing and preventing acne, pimples and skin reactions, naturally. The case shown below was cured by Dr. Anish Vaknalli using homeopathic remedies within 6 months. Though acne is commonly seen in teenagers, it may also affect adults in their late 20s and 30s. Though not life threatening, acne can cause sever scarring and affect ones self-confidence.